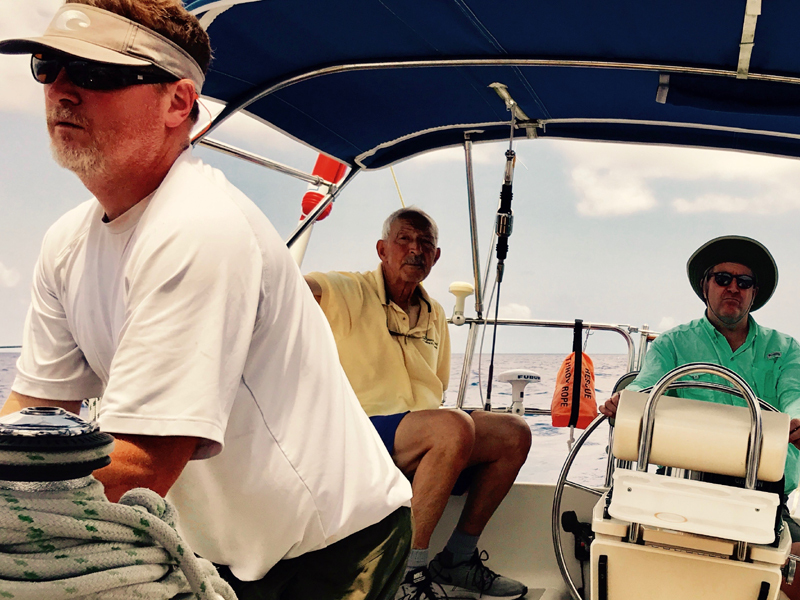 S/V NAVIGATOR has been in St Georges, Bermuda since June 2, 2017 arriving from Norfolk, VA with the outbound student crew and Captain Tom Tursi and Mate Captain Jerry Nigro. The outbound crew has since departed, and our return crew arrived onboard at various times on June 6th. That evening we went to dinner at The Warf restaurant for a relaxed evening for familiarization with each others backgrounds and goals for the cruise. The next morning, June 7, we commenced with pre-departure training including deployment of all sails individually at dock including the mainsail, staysail, genoa and trisail; boom crutch; winch handling techniques; sea anchor deployment; abandon ship walk through; man overboard procedures; watch procedures and logbook; boat inspection stem to stern; electronics; navigation prep; and weather data sources. Joe operating the NAVTEX equipment and receiving the single side band e-mails from Brad as they were available. Matt doing the VHF radio Bermuda forecast and the single side band USCG voice forecast over that radio. Steve doing single side band (SSB-Pactor) Sailmail graphics and text forecast. Adrian was assigned to download from the internet information on the Bermuda forecast graphics and text and the NOAA high speed graphics and texts at Predict Wind and Passage Weather. Once underway, everyone is doing the same assignments with the exception of the information that Adrian was downloading from the internet since we can't get that underway. During our pre-departure training, there was a lot of wind from the southwest generated by a slow-moving Low pressure system far to the north of Bermuda. This Low has been causing havoc here. We had 40 knots of wind on June 7 and 8 while we were doing training but we got through it all just fine. We were planning on departing on the 9 but delayed one day because of reported wave conditions near Bermuda in the 9 to 15 foot range with 30 knot winds. So we held off for one day and departed Bermuda at 0915 today through Town Cut Channel. S/V NAVIGATOR, our Island Packet 40 departed Bermuda bound for Norfolk Virginia at 9:30 AM EDT on June 10. The student crew arrived on the evening of June 6, and June 7 and 8 were spent in preparation for the voyage. The planned departure date was June 9, but was delayed due to high wind and seas. The crew members are: Captain Tom Tursi Skipper, Captain Jerry Nigro First Mate, and student crew members Adrian Ciuperca, Joe Jacobs, Matt Emerick and Steve Thorup. NAVIGATOR will make the passage to Norfolk via a non-stop ocean route. The cruise has an estimated distance of 670 nautical miles rhumbline, and will take approximately 6 days, sailing both day and night. Sunday (6/11 ) winds ENE 10 - 15 veering E during the day. Chance of rain decreases over the period. No tropical activity noted. As of noon today, crew assignments rotated down-list one spot so that Adrian is now student Captain, Joe is Mate, Matt is Navigator and Steve is Weather Communicator. We will rotate down the list each day at noon. We just exited Town Cut Channel about 20 minutes ago and we immediately had a rain squall come up and we all got soaked, since we were slow getting our foulies on. We are out of that now and are motoring around the east end of the Bermuda reefs and pretty soon we will be turning toward the northwest to get on our initial track toward Norfolk. We're supposed to have light air for the next couple of days, but from the southwest, which will be a good direction for us so maybe we'll be able to do some sailing or motor-sailing. The forecast for today was 15-18 knots. We're not seeing it now with the squall that came through but after the squall clears that wind will probably come back, and if it's from the southwest then that would be good. We had Dinty Moore beef stew out of a can expertly prepared by Steve and Matt. Dinner was served at 5:00 pm per the ship's Watch Bill. This early hour is intended to allow this meal and cleanup to be completed at an early hour so the evening watches can get to their bunks and rest before nighttime operations. Jerry and Joe washed dinner dishes in buckets of seawater. At 1830 skies were 90% overcast; winds SSW 8 to 10 knots; boat speed 5.5 knots; seas rolling across from the south at 2 to 3 feet; beautiful evening at sea with comfortable air temperatures. Three working sails are up including full mainsail, genoa and staysail. Adrian and Tom are currently on watch for the 1600 to 2000 afternoon watch. Jerry and Joe will be coming on for the 2000 to 2400 evening watch, and Steve and Matt later for the 2400 to 0400 mid-watch. 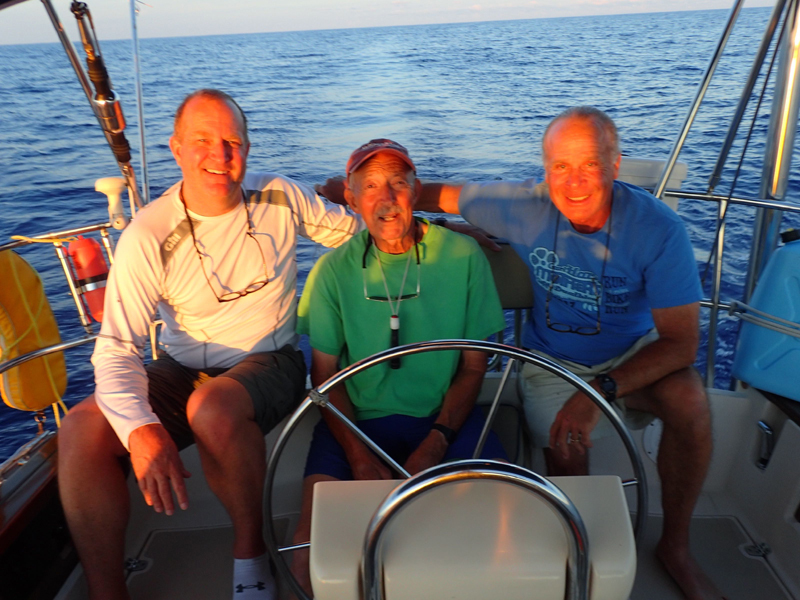 After clearing the shoals north of Bermuda, we established a waypoint 30 miles to the SW of the Diamond Shoal buoy on the west side of the Gulf Stream near Cape Hatteras to be used as a target point with the intention of riding the Stream to the NE and around Hatteras. That target bearing currently bears 300 degrees magnetic, and we are able to hold this course close hauled on port tack. We had light winds most of today and were motor sailing or sailing most of the afternoon and evening, then by 8:00 PM or so we started having rain and lightening and we had that on and off through the night. There is a big Low Pressure system north of Bermuda, quite a ways up in the North Atlantic, and that just hung around and didn't move, and it had the Bermuda weather screwed up for the past week. Monday 6/12 - winds continue ENE to E at 10 - 12 through the day. Becoming SE 5 - 10 in the late afternoon and evening. Tuesday 6/13 - winds light and variable mainly ESE to S at 5 to 7. Surface high pressure continues to dominate the wind pattern. Today we are still getting the effects of that Low. Bermuda weather called it a "quasi high pressure system" and I have never heard that term. Last night we had lightening, thunder and rain all night long. Then this morning when Adrian and I were on the 4-8 watch it was threatening for most of that shift. 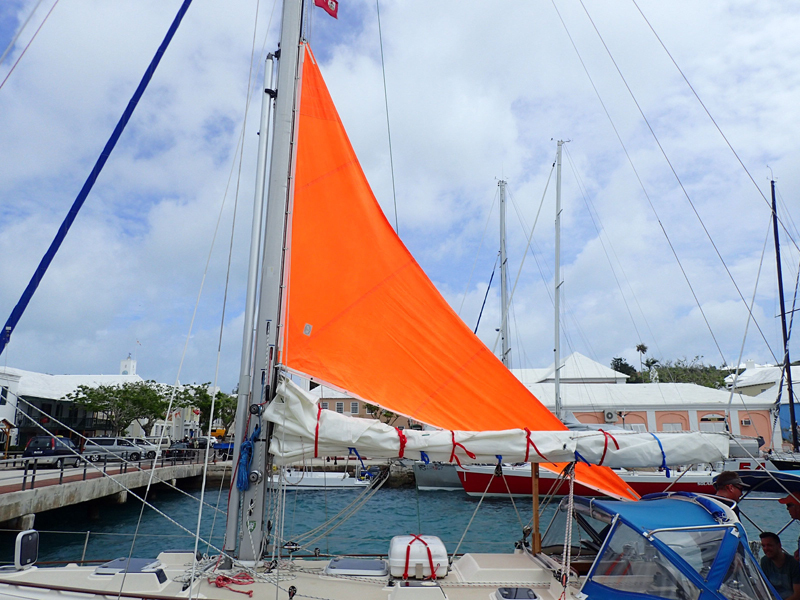 Mainsail was set with a deep reef and the staysail was up; no genoa. Sailing on a beam reach at 6 to 7 knots. 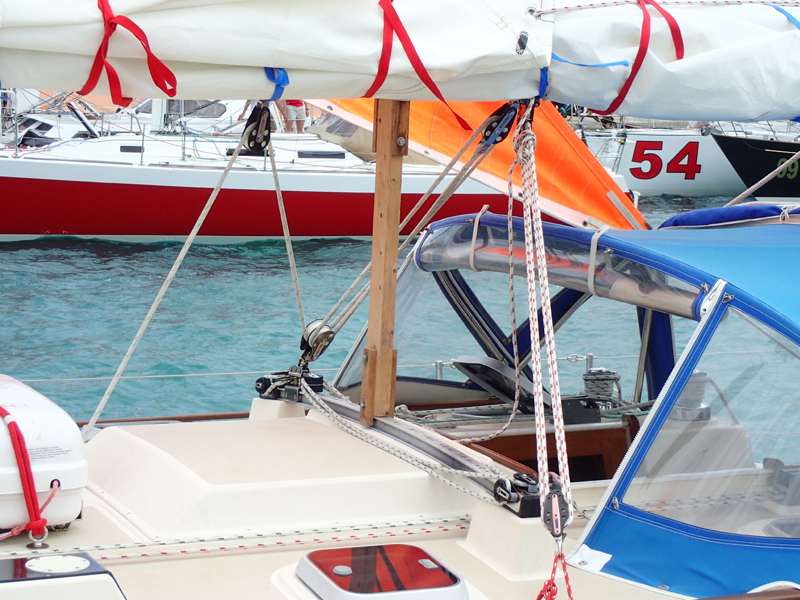 The boat performed beautifully under these conditions with winds up to 25 to 30 knots. Waves were 2 to 4 feet and we were paralleling them and not cresting them. About 0600 we starting getting squalls and heavier rain than I ever recall seeing for about an hour and a half. The entire seascape was white with the driving down, torrential rain. We were both totally drenched. So we came off our watch at 8:00 AM and Jerry and Joe came on. Naturally it started clearing up for them! We had some on and off showers during the day today and about 5:00 pm the cold front finally came through and clarified itself and we have nice cool, crisp, dry air coming from the north now. We've been sailing very nicely for the last several hours. We are sailing along on a course of 300 degrees magnetic and making about 5-6 knots. It looks like it will be a nice evening. We're getting ready to go into the overnight hours and Jerry and Joe are about to come on watch. Tonight we had spaghetti with turkey meatballs and pasta sauce. Adrian and I are on watch during the dinner hour. Steve and Matt are doing the cooking and Jerry and Joe are doing the evening dinner dishes. Jerry scoops up a bucket of seawater and fills up some other buckets on board and then they wash the dishes and we dry them off with a towel and they stay salty for the next meal. But it's sea salt, which is good salt, right? When sailing, we are on a four-hour interval for battery charging and refrigerator operation when we run the engine at 1200 rpm, gear in neutral, for that purpose. We have 405 miles to go to our next waypoint which we set at about 30 miles southwest of Diamond Shoal buoy which is right off of Cape Hatteras. When we get to that point we will be in the Gulf Stream and then we'll have another 130 miles or so to go from there. We are on 4-hour watches. 12:00 to 4:00 is Steve and Matt (Midnight to 0400 and Noon to 1600), 4:00 to 8:00 is myself and Adrian, and 8:00 to 12:00 is Jerry and Joe. That is working out and everyone is getting along very well. We also did some celestial work today. Both Matt and Steve got really good shots with high accuracy. Adrian has taken a shot but we haven't yet calculated his accuracy. Matt got within a tenth of a mile and Steve got within three tenths of a mile. Pretty good for beginners! It's usually referred to as a quasi-stationary high pressure. The Bermuda high is trying to assert itself. Monday (6/12) evening - it is tough to predict a wind direction with that surface high almost on top of you. I'll call it SE 5 to 10 early tonight veering S 5 - 7 overnight. A degree North of your position, winds are from the WSW at 10. Tuesday (6/13) -winds SSE at 5 in the morning. becoming SW at 5 in the afternoon and WSW in the evening. Backing SW overnight. 0400: Clear skies; bright moon; a few stars; flat seas; motorsailing at 1600 rpm with reefed mainsail and staysail for roll stability; course 285ºM; bearing to Diamond Shoal waypoint is 298ºM; distance 368 NM; winds NE 4-8 knots. Quite different conditions than yesterday at this time when it was raining cats and dogs with strong gusts and lightening. At 0600 winds increased to NNE 8-10 knots; all sails up; sailing at 5 knots; heading 295ºM; clear skies. This afternoon we again had a beautiful sunny day. We're about 330 miles from the waypoint SW of Diamond Shoal buoy, which I talked about yesterday. We're on a course of about 300 degrees and motoring right now and making about 4.5 knots under motor. Overnight it was beautiful. We had clear skies with visible stars and moon and comfortable temperatures. This morning we had a nice wind come in from the north so we had maybe 8-10 knots of wind and were sailing along very nicely and making 5-6 knots. At other times the wind disappeared and we motor sailed. So it's been on and off all day. Right now there is no wind, and the forecast for tomorrow is for little wind. The forecast from Bermuda yesterday was that a meso-low would form north of Bermuda and would cause clouds, rain and thunderstorms but we are far enough west that this is not a problem. 2000. Motoring in very light airs. Bright clear sky. Just passed sunset about 10 minutes ago. Course of 300ºM. Running at 1800 rpm. Making 5.5 knots through the water, but losing about 2 knots to adverse current based on the GPS speed difference with the water speed. Many celestial shots completed today by all, and getting some very nice shot accuracies when compared with GPS position, which is what we do to improve shot accuracy and shooting technique and to build confidence in one's shooting capability. Joe and Steve are now below one mile in accuracy, which is very good. Matt is at about 7 miles, but is very consistent in his results indicating that his technique is solid, but that he needs to recalibrate his shot picture image; this will come with a little more practice. Adrian is at about three miles, and will be taking more shots tomorrow the weather gods willing. Steve also did a running fix with good results consistent with our DR plot allowing us to restart the DR plot based on celestial LOPs. We do not see the moon out yet, but that will come later and it should be a very pleasant evening. We expect the same conditions tomorrow. Today we tried a compass calibration using a pelorus. We had also tried in St George's Harbor and had very nice conditions there for the level sea surface but kept losing the sun in the clouds. Today we had beautiful sun but we had rolling wave conditions that was taking the boat back and forth. We completed the process but have some very spurious results due to the wave action. We went through the whole process, so it was instructional from the process standpoint, but the results are poor. We'll try again if we get some good conditions. Tuesday (6/13) evening and overnight - winds S at 5 - 10 becoming WSW 5 - 10 overnight. Thursday (6/15) winds WSW to SW at 10 to 12 - chance of showers increase. Nearer the coast, the winds become more consistent. 0400: Clear skies. Bright moon. No wind. Motoring at 1800 rpm on a course of 300ºM at about 5 knots. Distance to Diamond Shoal waypoint 274 NM. We had another beautiful day today. Sunny all day with light winds. We're sailing along now very nicely at about 5-6 knots in an 8-10 knot breeze, headed towards our waypoint SW of Diamond Shoal. Our course is about 285 degrees magnetic and we have about 200 miles to go to the waypoint. We did a lot of celestial shots today. Some got running fixes. We're checking off a lot of the ASA 108 requirements as we go. Since the weather has been so good and the seas smooth, we've been able to work on the 108 tasks so we're making good progress on that. For dinner we had baked beans and hot dogs with sauteed cabbage and carrots, and fresh cucumbers as a side dish. A little embellishment tonight! Thursday (6/15) - winds WSW 10 - 12 becoming SW 10 - 12 in the afternoon - turning S to SE above the NC / VA line. Winds SW at 10 - 12 in the afternoon and overnight. Chance of showers and T-storms increase. A tropical wave just off the Cape Verde Islands approx 5N 25W poses no immediate danger. 10% chance of tropical storm formation in the next 24 hours. 0845; 118 miles to the Diamond Shoal waypoint on a heading of 285ºM. We have been steering on a course of 300ºM, which puts us north of our track to destination and we have been giving up our southing and the position needed for optimum Gulf Stream entry down near Hatteras. So we're going to tack south and try getting some southing back. You may notice on the Spot track that we made a left turn and sailed on that tack for a few hours to improve our angle on the Gulf Stream. We have prevailing southwesterly winds and if there is no weather system coming through, then the further south we get the less chance there is that we will need to sail close hauled in opposing wave conditions. The winds this afternoon went from SW to SSW to W and back to SW and that has caused us to change headings and sail combinations in order to maintain a direction towards that destination waypoint. 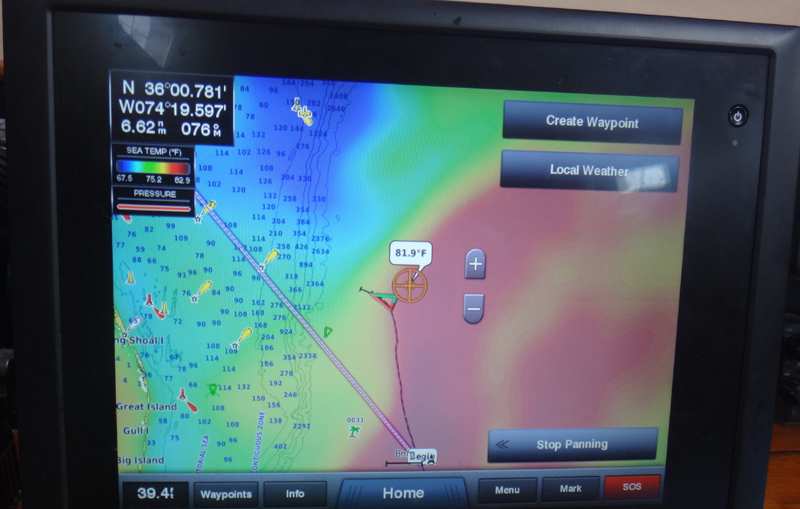 So after we went south we were happy to see that when we tacked back to port tack that we were able to make a heading directly toward our waypoint. We sailed on that heading for awhile but it was a little rough because the waves came up, so we fell off a little bit to starboard and had a softer entry to the waves. We're now hitting them at an angle instead of square on. 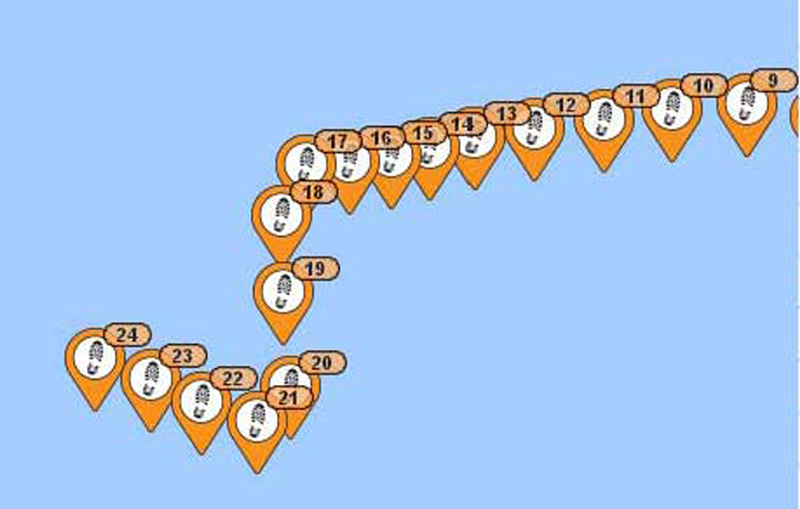 SPOT satellite tracker showing our turn to the south on June 14 in an attempt to get further south to enable us to reach our Diamond Shoal waypoint. In the end, this was to no avail since the Gulf Stream continued to push us northeast and away from that waypoint. 1600: Increasing seawater temperature to 84ºF along with opposing current indicates that we are entering fringes of the Gulf Stream. 1900: It was another sunny, beautiful day. We are sailing on a course now of 295ºM and still heading towards our Diamond Shoal waypoint which is near the western edge of the Gulf Steam with about 95 miles to go to that point, and we're looking to begin entry to the Gulf Stream soon. We're reefed down now. We have a full genoa and a double reefed mainsail and no staysail flying right now. 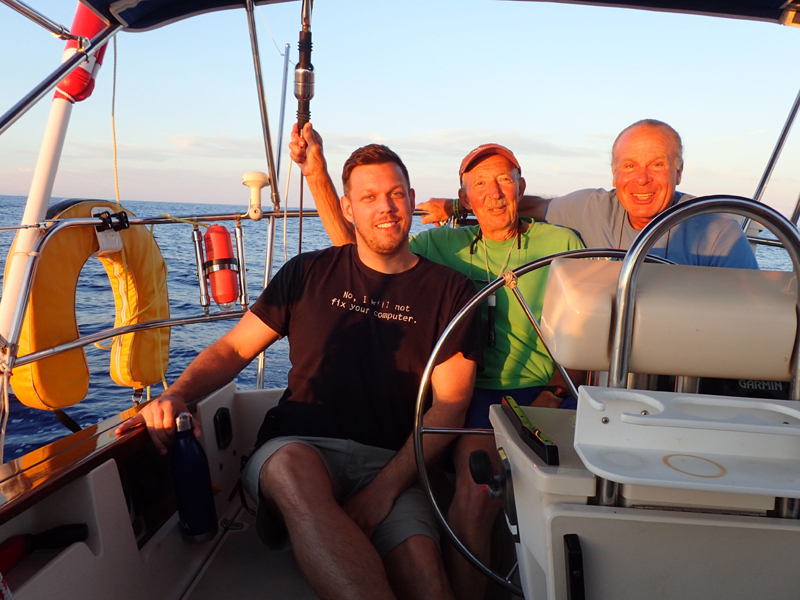 During the day we had everything up, full main, staysail and genoa, but when the winds came up to 20 knots, we were making 7 to 8 knots through the water. The wind speed has dropped now to about 13-14 knots and we're sailing at 6 to 7 knots. We're prepped with our sails reefed down for overnight. Right now we have an opposing current of about a knot and a half so that slows our speed over ground a bit. No ETA yet. So much will depend on what the Gulf Stream does to us. I won't really have a good idea until tomorrow after we have cleared the Gulf Stream. We had chili and rice for dinner. Cucumbers and carrots. Everybody is kind of relaxing now and Adrian and I are on watch until 8:00 pm. Friday (6/16) morning - winds generally WSW but could swing from Northward - continued light and variable 5 - 8. Becoming S to SW in the afternoon and evening. Continued S to SW at 5 - 7 overnight. We have a Sirius XM weather continuous feed into our Garmin system within about 200 miles of the continental US. It gives forecast graphics showing Highs and Lows, cold and warm fronts, precipitation and lightning squall areas, wind and wave directions and strengths, and sea surface temperatures indicating the Gulf Stream actual locations; these are not the NOAA graphics, but are the Sirius XM interpretations. It also gives verbatim the NOAA marine zone coastal and offshore text forecasts, which are very valuable as we approach the coast. 0130: we are being set considerably to the right of our track by the Gulf Stream current and it looks rather impossible that we can reach the Diamond Shoal waypoint. So, we completely revised our course strategy and reset our next waypoint to a position 50 miles to the NE of the Diamond Shoal buoy. This means that Norfolk will lay to our NW once we mount the continental shelf, which is ok unless we encounter a new cold front coming off the US coast that would give us strongly opposing NW winds that we'd need to battle against. But, such a front is not indicated by the forecasts. So we're on a course of 337ºM heading toward that new waypoint and being set to the right of track about two miles per hour by the current. Well, we wanted to get to our waypoint located about 30 miles WSW of the Diamond Shoal buoy to enable us to cross the Gulf Stream close to the shoal where the Stream crossing would be its shortest, but conditions prevailed against us in that regard. We were too far north to allow achieving that waypoint due to the prevailing westerlies that we encountered during the previous few days during which we would have needed to sail hard on the wind close hauled against winds and bow-on waves. Also, we were full-on into the Stream for the past two days since the morning of June 14, and the NE flowing Stream had pushed us in that direction making our Diamond Shoal waypoint all but impossible to reach. So, we bit the bullet and, and on the early morning of June 15, we set a new waypoint about 50 miles to the northeast of the Diamond Shoal buoy bearing 335 degrees magnetic from our current position, a course that we could achieve in the prevailing westerlies. However, even on this course we could clearly see the effects of the Gulf Stream flow, which set us to the right of our desired track by a mile and a half per hour. Boat speed plus Gulf Stream current is putting our speed over ground at 7 to 8 knots. This Sirius XM Weather image on our Garmin multifunction display shows the Gulf Stream in red and the continental shelf in yellow-green. Cape Hatteras is to the lower left of the screen and Norfolk would be to the upper left off the screen. 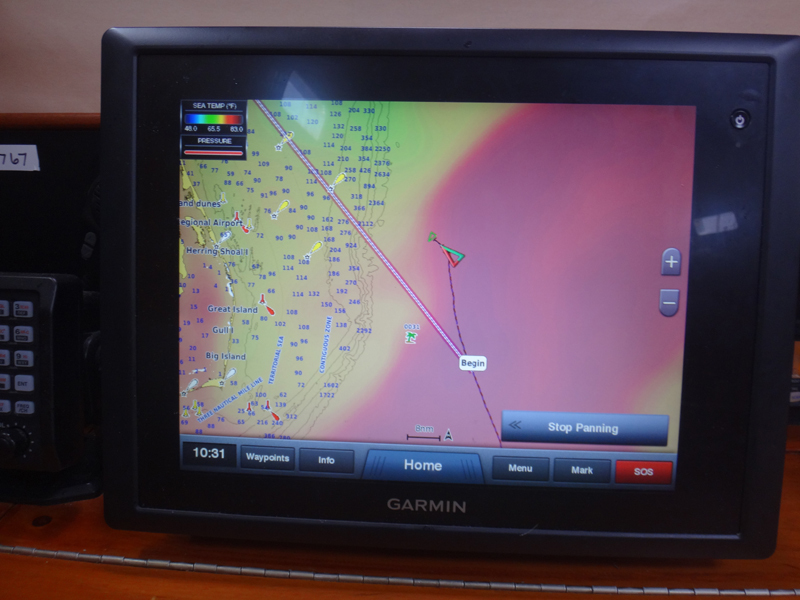 Our boat is shown as a red and green triangle in center screen, and our course line to Norfolk is the magenta colored line tending to the NW. The green palm tree was the waypoint that we were pointing to, but you can see how the Gulf stream has pushed us considerably to the NE of that line. On the afternoon of June 15 we popped out of the Gulf Stream as confirmed by lower seawater temperatures, reduced current effects and the Gulf Stream images appearing on our Sirius XM weather screen. Exiting the Gulf Stream shown in pink and headed for the continental shelf shown in green and blue with depth numbers. 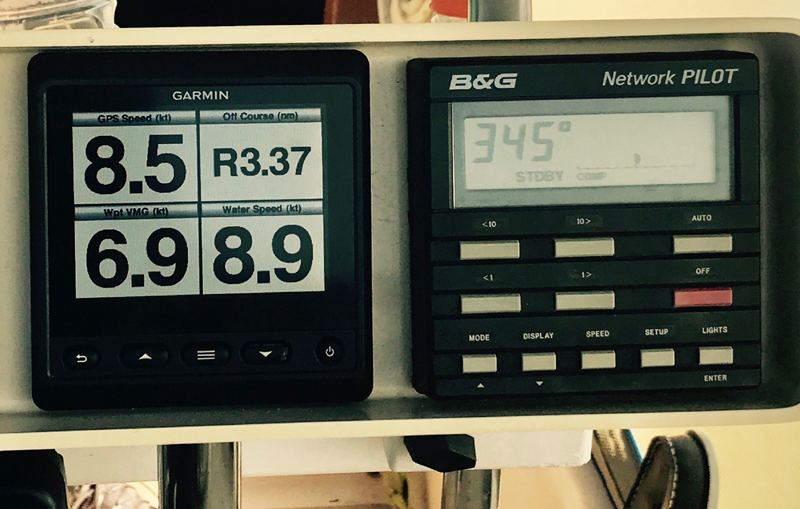 A few hours later seawater depth reduced to less than 600 feet as we mounted the continental shelf from the high seas depths in excess of 15,000 feet indicated by the ocean charts. Shortly thereafter we ran into dense fog, which persisted the remainder of the day and overnight until we reached Norfolk and entered the Chesapeake Bay. Also, the wind disappeared completely and we proceeded under motor directly toward our next waypoint near the Traffic Separation Zone, which leads shipping into and out of the Chesapeake Bay. The fog was an interesting challenge, as we had a close encounter with a cargo ship passing one mile ahead of us (and we could not see the ship at that close range so dense was the fog) after two-way VHF voice communications with the ship and an agreed on passing strategy. 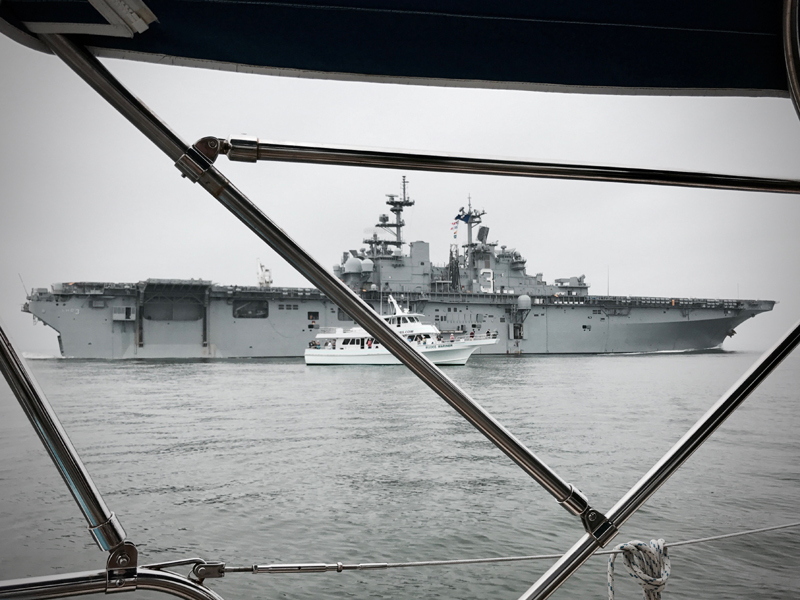 Our AIS system identified the ship as it approached more than five miles distant on our port side, but he did not see us on radar or AIS until we were within 3.5 miles. Left shows Jerry scanning the fog for the ship that's passing ahead of us. Right shows the fog but not the ship. After the ship passing we maintained a very rigid deck watch including radar, AIS, sight and sound throughout the overnight hours and the morning of June 16 until we reached Norfolk. At 0600 we had reached the south entry point of the Traffic Separation Zone, but we opted to proceed outside of the zone and parallel to it toward Cape Henry the southern entrance to Chesapeake Bay. As we arrived there, we radioed the Virginia Pilots to advise them of our entry into the Precautionary Zone, where Pilots embark entering cargo ships for their routes into Chesapeake Bay, and of our planned route to the inbound Auxiliary Channel on the north side of Thimble Shoal Channel. A friendly encounter in Thimble Shoal Channel. From there we proceeded over the southern tunnel of the Chesapeake Bay bridge-tunnel and into Little Creek harbor where the US Navy maintains the Little Creek Amphibious Base and on to our slip at Cobbs Marina. We also phoned the US Customs office and arranged for entry clearance arriving from a foreign port, and they said they would meet us at Cobbs Marina a noon. We also phoned Cobbs Marina to receive slip number and docking instructions, and by noon we were safely tucked into our slip having completed an ocean cruise from Bermuda of 816 nautical miles in six days and two hours, for an average of 134 nautical miles per day. Farewell my shipmates... May you forever remain in the good graces of King Neptune! !